The hobby-horse velocipede was all the rage in the spring and summer of 1819, dozens could be seen at any one time in London and elsewhere. This was the earliest form of personal transport on wheels, pre-dating the bicycle by more than forty years. The machine’s novelty ensured that it was of very general interest, but in some places it was ridiculed, particularly when ridden by the smart young genthemen of the day, the Regency dandies. The Prince Regent himself owned four hobby-horse velocipedes. In only a few months, some eighty hobby-horse prints were produced by a variety of artists and publisshers, some depicting the hobby-horse and its derivatives in a favourable light, others gently mocking the craze. 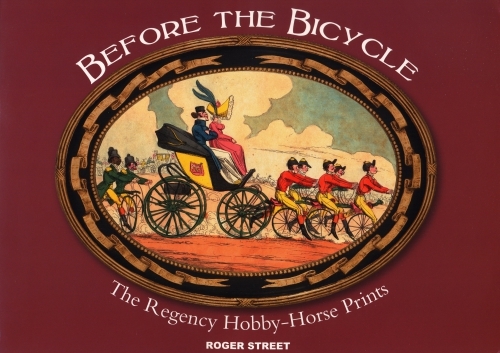 For the very first time this book displays colour reproductions of all the hobby-horse prints for a twenty-first century spectator to view, with an explanatory note for each print. A brief introduction at the beginning of the book discusses the history of the pedestrian hobby-horse phenomena, and aspects of the many prints to which it gave rise. A foreword by Regency historian Kathryn Kane provides a wider historical perspective. 2014- 174 pages, format 21 X 29,50 – Artesius Publications .